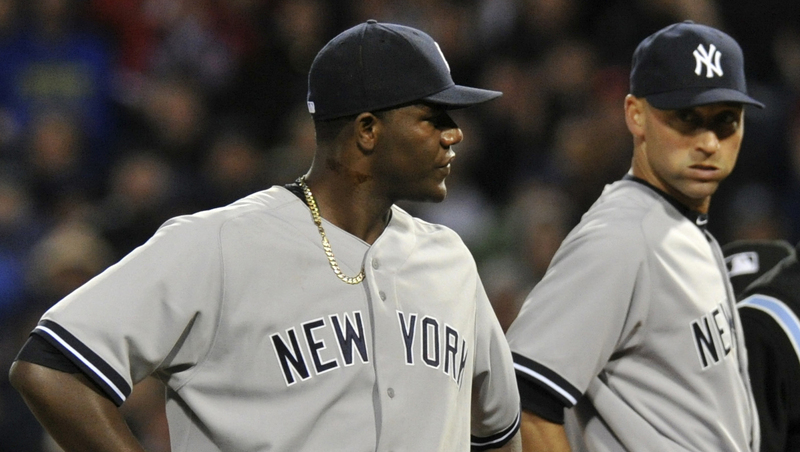 BOSTON - Less than two weeks after pitching against Boston with what appeared to be pine tar on his pitching hand, the New York Yankees' Michael Pineda was ejected from a game against the Red Sox on Wednesday night after umpires found a foreign substance on his neck. Boston manager John Farrell didn't alert umpires about brown goo on the lower part of Pineda's right palm during a 4-1 win over Boston at Yankee Stadium on April 10. Photos of Pineda's pitching hand that night sparked a debate about pitchers' use of sticky substances to get a better grips in cool weather. With two outs and a 1-2 count on Grady Sizemore on Wednesday, Farrell left his dugout to talk with plate umpire Gerry Davis, who went to the mound. Davis touched the right side of the pitcher's neck with his index finger then ejected Pineda as other umpires and Yankee infielders stood nearby. On a night with a game time temperature of 50 degrees, Farrell had said before batting practice: "I would expect if it's used, it's more discreet than last time." Pineda left with the Yankees trailing 2-0 after he allowed two runs and four hits in the first inning. He was replaced by David Phelps. "We will talk to the umpires tomorrow and review their report before taking any action," Major League Baseball spokesman Michael Teevan said. In recent suspensions of pitchers for pine tar, Tampa Bay's Joel Peralta was penalized eight games in 2012, the Los Angeles Angels' Brendan Donnelly 10 days in 2005 and St. Louis' Julian Tavarez 10 days in 2004. The suspensions of Donnelly and Tavarez were cut to eight days after they asked the players' association to appeal, and Peralta dropped his challenge with no reduction. In Pineda's previous start against the Red Sox, television cameras caught Pineda with what appeared to be sticky pine tar on his hand on a cool night. Farrell didn't see a photograph of Pineda's hand until the fourth inning; when Pineda came out to warm up for the fifth, his hand was clean. "In conditions like last night, it's not uncommon for pitchers to try and get a grip in some way," Farrell said later. "We're more focused on what we need to do offensively to kind of get going rather than taking anything away from his abilities." Joe Torre, MLB's executive vice president of baseball operations, said in a statement April 11 that Pineda would not be suspended for the substance on his hand. "The umpires did not observe an application of a foreign substance during the game, and the issue was not raised by the Red Sox," Torre said then. "Given those circumstances, there are no plans to issue a suspension, but we intend to talk to the Yankees regarding what occurred."